The smartest investors this year have been in cash. For the first time since 1990, cash is outperforming stocks and even most bond funds, according to Bank of American Merrill Lynch. 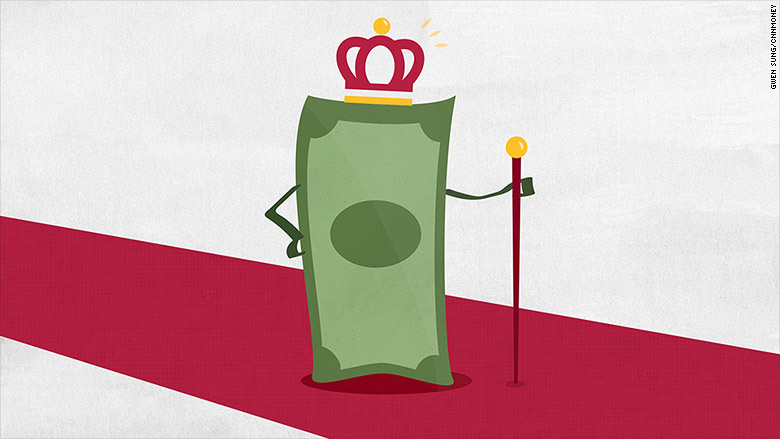 "Cash is king," declared Bank of America in a recent research note. Make no mistake, no one is getting rich by putting their cash in the bank or money market funds, the investment world's equivalent of a penny bank. Returns on money market funds so far this year are a meager 0.01%, according to Morningstar. Returns have been anemic since the Federal Reserve has kept interest rates near zero for seven years now. If you shop around, you can get a bit of a higher return, but it's not much to celebrate. Cash isn't great. It's just that everything else is doing so much worse. The Dow is down over 10% so far this year. Overall, the typical U.S. stock fund has lost 5% in 2015, according to Morningstar. One of the most popular funds in the world -- "SPY" which tracks the S&P 500 -- is more than 8% in the red for the year. Bonds are a tad better. The average return for taxable bond funds is down almost 1%, according to Morningstar. Popular bond funds like Fidelity's Total Bond Fund (FTBFX) and Pimco's Income Fund (PONDX) have shed nearly 2%. The bright spot has been municipal bond funds. Despite headlines about Puerto Rico's recent default, muni bonds have been a solid bet, returning gains of about 1% so far this year. They also aren't taxable, which saves investors on some fees. Investors have noticed what's happening. Since the stock market plunged dramatically at the end of August, people have put more and more money into money market funds, according to Bank of America. Ric Fiano of Savannah, Georgia is one of the investors who has made changes. "The market is at the top," he told CNNMoney. "At end of 2014, I started liquidating so I have a reasonable amount of cash." It's not the type of investment he wants long-term, but right now he thinks it's wiser to have more in cash and less in stocks. He's waiting for a better moment to get back in, possibly when the market drops 20% into a "bear market." At the moment, the market is down about 10% from its peak. "Our mantra is: safety, liquidity and yield. You want those three things. You don't want to be susceptible to market swings," says Lu Ann Katz, head of global liquidity for Invesco. She oversees about $80 billion, mostly in money market funds. Katz points out that investors today have a lot of options in the "cash and cash-like" space. She often works with clients to combine a money market fund with a slightly more aggressive ultra short bond fund. That can boost returns while still keeping the money very easy to access and low risk. The expectation is the Fed will raise interest rates -- in December of this year. That should also lift money market fund returns. But experts caution against timing the market because you have to get two decisions right -- when to get out and when to get back in, otherwise you risk losing out on gains. "At this point, we're not suggesting any tactical moves," says Sharon Stark, fixed income strategist for D.A. Davidson & Co. "Over the next five years, we do expect stocks to outperform." Some strategists even predict stocks will end the year modestly positive. But after several years of stellar stock market performance, it's tough to watch cash take the investing crown.